War of the Spark, 36 planeswalkers. Rare and uncommons. 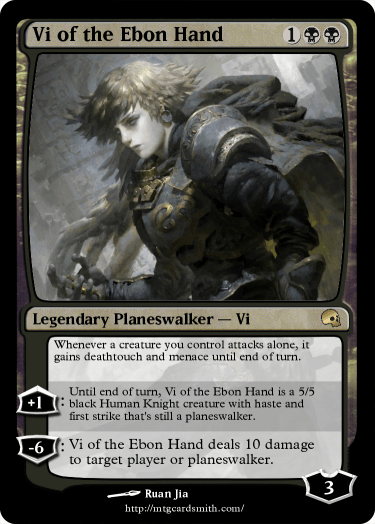 How would you design planeswalkers you have created as a rare and as an uncommon following the design of the war of the spark planeswalkers. rares: static ability, 1 + ability, 1- ability. Uncommons: static ability, 1- ability. Please post original, rare and uncommon version of the planeswalker you choose. Contest will close the day War of the Spark is released. ranking will be based upon fitting the rarity format, with correct rarity, usability and not being a completely broken card. 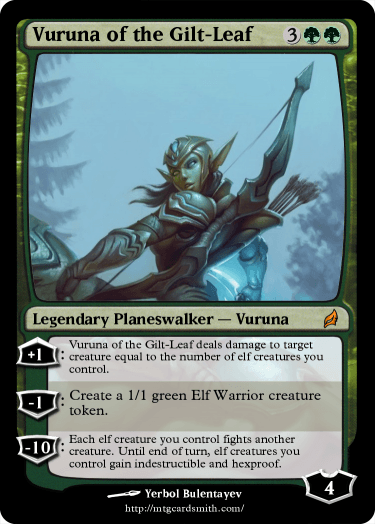 Do we make new versions Planeswalkers in war of the spark or entirely new ones? I made this one a few days back after commenting on the fact that the artist Daarken sounds like a planeswalker name. 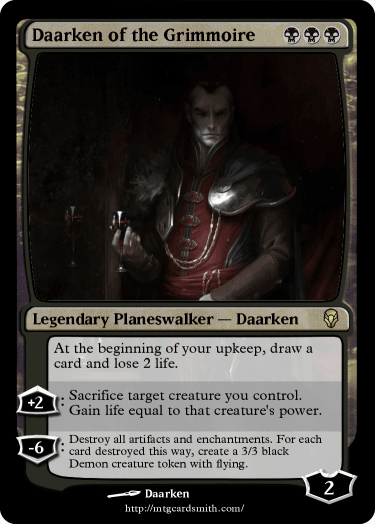 Shadow123, make planeswalkers with the formating that is being used in War of the Spark using a planeswalker you have created. 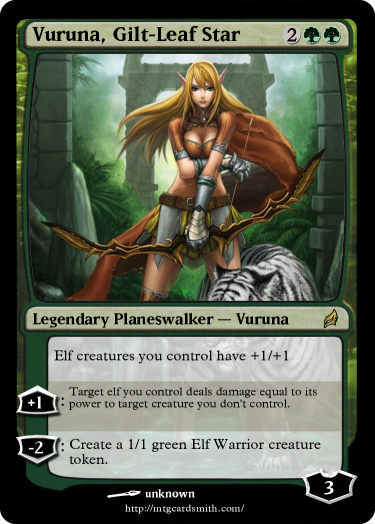 Sephina is an ongoing Planeswalker I created. Her lore and other related cards can be found at https://mtgcardsmith.com/user/RayearthIX/sets/30425. Sephina had reaffirmed her purpose on Ravnica, and was prepared to do what she could to help those who could not help themselves, before moving on to another plane. However, with the rise of Nico Bolas, and in light of his plans, she knew she had to look past the faults of others to become their allies. 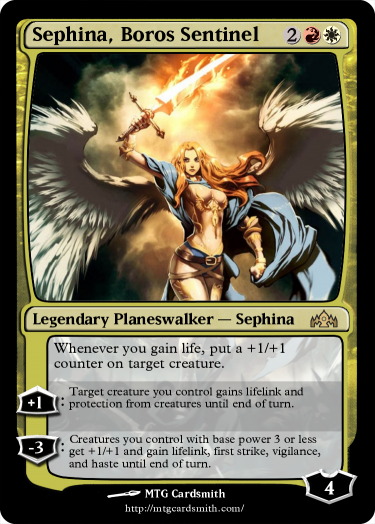 As such, Sephina has taken the mantle of an Angel of Boros, with understanding of Aurelia that it will be a temporary assignment, to bolster the ranks of the Legion and fight against the menace that is Nico Bolas. 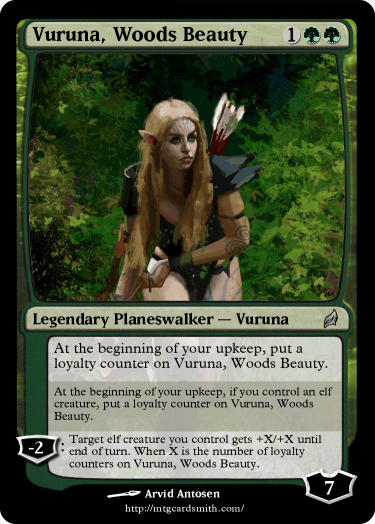 The original Vuruna is a full-grown Lorwynn elf on the almost top of her caste, an Exquisite..
As an Immaculate, she has some degree of influence on her people and even she can call for help to them, and they will answer. She is a Faultless, she is a commoner but her beauty can inspire another fellow elf on the battlefield. Guys. I have official War of the Spark cards already. The United Assault challenger deck has Ajani's Pridemate with the War symbol. This is a W.O.T.S planeswalker version of another old one that I made but deleted.